Finch is a popular bird that can we meet easily in home settlement. Unlike to other bird, finch used as pet bird because their some uniquely. Believe it or not, finch has some special skills like easy to be tamed and quick survivor, being disaster natural detector, and smart imitator. 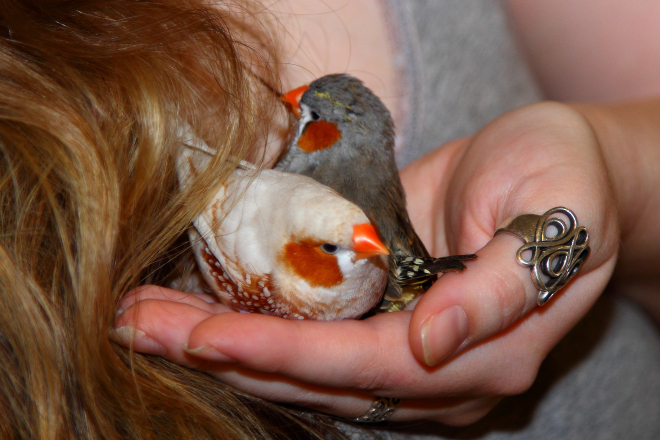 Back to the reason why people choose to pet finch especially for birdsong lovers? Well they are mostly said as alternative way if they have low budget to pet beautiful birdsong. We can avoid the fact that finch can imitate other bird’s voice beautifully. The tweet of bird is usually using as sign the bird is getting used to you or not. It also signed as happy and calm feeling that they are can express. The more the tweet, it is more indicating that your bird is getting used to you. Besides from the tweet, what else which inform you and how to make finch bird getting used to you? Here is the information. Here is some information you need to know what’s symptom if your finch is still scare of you. As we know that finch has natural panic-easy behavior. This is can inform you as natural symptom that they are not getting used to you. If you find them like to crash their self to the cage, you know what the meaning right? Yes, it is. They are still scare of you. Not only that, if you find them just crocked or stay silent in the cage it means that they are also still scare of you. Therefore, it is important for you to know the habit behavior of finch if you want to pet them moreover if you have purpose to add them into a competition. Their stress level must be reduced as soon as possible to make their tweet louder. Finch which won’t to eat actually can be sign that they are still stress and tried to adaptation with new environment. Even they are a good quick survivor, they are still need a time to face the process. When you find them didn’t eat their food, you must be careful and find some new method to care them. This symptom can be a sign of sick, but if you just take your finch at your home it is surely not symptom of illness. After know the symptom, so how you can do to make finch getting used to you? The way which can make you closer with your finch is touch them commonly. You can touch them when they are eating or bathing. Touch them from here head until their tail. Touch them softly as common as you can. This method need to practice makes your finch is not escape. The benign finch automatically will looking for role model voice to be imitated. Well this is mainly thing that you want to started pet some animals in your home. Back to the natural-behavior of finch which is a good imitator, you must aware that good imitator also has good observation. Therefore, show your truly love and care will open up their mind that you are good person and make sure they are assume that you can using as friend. You must tell them that you are not hurt them by showing your care and love to them. You can start it by feed and bath them well, and don’t forget to touch them commonly. Clean up their poop commonly in the morning and evening and change their water also can be your alternative way to get closer with them. And the most important, you still can take care and also get closer to them at the same time. It is more effective right? How we can do it? Firstly, Choose one role model bird voice then let your finch heard it. Secondly, put the role model beside your finch. During the time, your finch will able to imitate it and started to tweeting as same as what they are heard. If you don’t have other bird which uses as role model, you can download it from internet and equalize it with your finch. You can play it under the cage. As mentioned before that finch bird is a good observer, so it is important for you to choose the right side to place their cage. Don’t place their cage in the terrace home. Why? When your finch see the wild bird, it may be makes them to imitate it. It will triggered them to escape and won’t to obey your said. Your finch is become harder to benign and moreover hard to tweet. So where the place i better place the cage to make them getting used to me? The right point to place their cage to make them closer with you is in the side which often passed with you and your family. This method can make your finch getting used with human and of course with you. Beside to make your finch is getting used to you the right place picking will help your finch learn some voice quickly. It is not effective enough to place your finch outside your home with noisy position. Well it is maybe extreme method that you can use for make your finch getting used to you. When the finch just came to your house, firstly bathing them until the water wet their whole body. You may panic see your bird is panic and moving randomly and also break their peak. Don’t you panic at this situation because it is their natural responses when it faces this method. Secondly feed them after bathing process. Don’t forget to give their food using a stick. If your finch is not responded, leave the food to the water place. Leave him some moments. If in the end your finch eats the food that you leave, you can give the food directly. Don’t forget to trade-off when you give the food. Don’t give him easily and directly if your finch is starving. It makes your finch is dependent to you and start to getting used with you. You better pet a baby finch than adult finch. Besides the treatment is relative still easy, you can built the relationship with them and you can be more effortless to make it getting used to you. Also, the baby finch is easy to be train than adult finch. But it is your choice to pick whatever you want.